I think the best aspect of Earthquake was how it handled change so well. The setting and characters are completely different to what they were in Earthbound, and yet the progression felt very natural, and not forced in the slightest. Another great aspect of this book was the characters. As I just mentioned, there is a whole new and different cast of characters in Earthquake, and a lot of the time is spent wondering who is trustworthy, and who isn’t. Which is always fun, in my opinion. I love being sceptical of characters, and wondering what their evil master plans are. I recently posted my review of Earthbound , and was reminded of how I felt when the book ended. I was all for this certain thing, and then that kind of completely changed as I read Earthquake. So, Earthbound ended and I was very much: woo, yeah! This thing has to go down because of back story and love and all those shenanigans. YUS. And then I started reading Earthquake, and this character that I had been so keen on turned out to be a bit of a bust … which is kind of sad, but also kind of good because then I did a complete 180: ohmygosh EW NO get away from that one, get with this one. Yesssss, this one is precious. The precious ship is just adorable, and I very much prefer his character to the other one (even though I was all for the first ship at the beginning of the book – but I guess that speaks for how awesome Pike is for being able to change my mind). The overall storyline was a lot more intricate and in depth than that of Earthbound, but I found that it added to the story, rather than took away from it. However, I felt that it was lacking in some places as the pacing was quite slow – to allow for character development, I suppose, but during some points it did lag a little. Unfortunately, I found it hard to relate and emotionally invest in our main character, Tavia. I’m not sure why, but my emotions are just not there where she is concerned. Sure, I am rooting for her and cheering her on, but not with the passion that I have for other characters in other books. 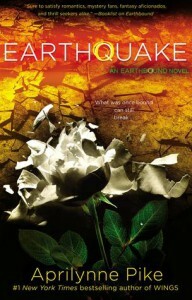 Earthquake answers quite a few questions that were raised in the first book, but there are still a whole heap of questions that are unanswered. The ending was definitely one that had me wishing for the next book to appear in my hands so I could figure everything out once and for all. This doesn’t really have much to do with the book itself, but rather my cover judger coming out, but I was sad to see that the beautiful simplicity of the first cover had morphed into this extremely colourful one. I like it, but I would have loved to see that trend of the first cover continued in this one. Your Turn: Have you ever switched ships in the second book of a series?